US-based Web Industries has invested in two W&H Astraflex 8-color central impression flexographic presses for its facility in Fort Wayne, Indiana, US. The new 64” wide printing presses, which feature quality control and defect detection equipment, will complement the company’s existing high-speed, wide-width converting machines. The new presses will be used to offer large format spooling, large outside diameter (OD) slitting, and wide-web multi-color printing services. Web Industries said that the new presses will also allow it offer visually appealing graphics with the assurance of defect-free products for consumer packaged goods (CPG) companies. Web Industries Corporate Development vice-president Kevin Young said: “Increasingly, consumer product companies are turning to multi-color printing to help differentiate their brands in the marketplace. The Web Fort Wayne facility uses slitting and spooling lines to provide large format converting of nonwovens and films. Web Industries offers optimized flexible material processing solutions designed to deliver converted product in the format of choice for efficient, cost-effective downstream product manufacturing. The firm expects the acquisition of the new printing assets to continue its focus on meeting the CPG market needs. 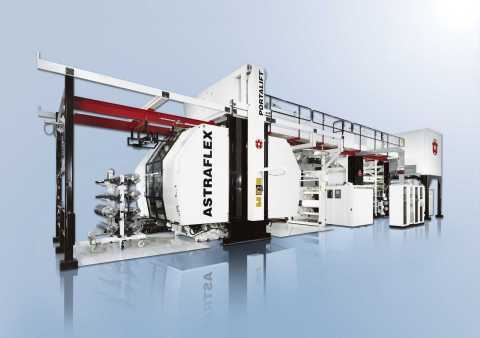 Image: A W&H Astraflex 8-color central impression flexographic press. Photo: courtesy of Business Wire.